Sacrosancta Lateranensis ecclesia omnium urbis et orbis ecclesiarum mater et caput. Of all the churches in the city and the world, the Most Holy Lateran church is the mother and the head. This phrase is inscribed above the entrance to Saint John Lateran. Surely this is a mistake, right? Isn’t Saint Peter’s Basilica the mother and head of all churches? No, as lovely and important as Saint Peter’s may be, it is not the mother and head of all the churches. This title belongs to Rome’s cathedral, Saint John Lateran. After Constantine defeated Maxentius in 312, he marched to this spot and dedicated the land to Christ. He gave the property to the Church so that a place for public worship could be built. As the first cathedral of Rome, it was dedicated Basilica Salvatoris, the Basilica of the Saviour. 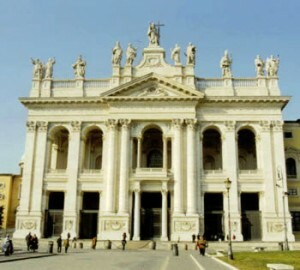 The church eventually became known as Saint John Lateran, named for both Saint John the Baptist and Saint John the Evangelist. For the next one thousand years, the Apostolic Palace was located here, beside Saint John Lateran. To put this into perspective, the pope has only lived at the Vatican for about seven hundred years. So, for one thousand years, this area was held in the same regard as we today hold the Vatican. It was the home of the Church. It was the home of pope. It was known simply as the Lateran. The Lateran gets it’s name from the former owner of the land, Plautius Lateranus. After a disagreement with Nero, yes, that Nero, Lateranus was executed and his family’s land was taken. The disagreement was that Lateranus felt the evil ruler Nero needed to be dethroned and killed. Throughout Holy Week we will return to Saint John Lateran two more times. We’ll dig deeper into Rome’s Cathedral on each visit. Tomorrow we’ll visit the church of Santa Prassede.